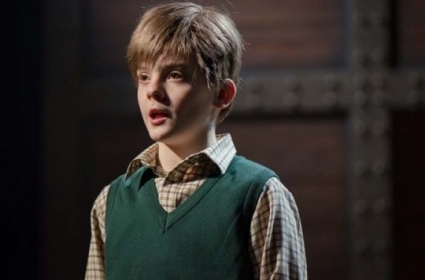 WOAPA student: Cameron Duncan is currently playing the role of 'Bruno' in the national tour of the Children's touring partnership's production of 'The Boy in The Striped Pyjamas'. Here are some press releases and reviews of Cameron's performances so far.
" ...the evening belongs to the young actors. Cameron Duncan captures the spirit of Bruno"
"Bruno, played with courage and conviction by Cameron Duncan"
" ...such excellent child actors that with mannerisms, expressions and movement the meaning is perfectly clear". "Cameron Duncans portrayal of Bruno is excellent with superb comic timing and convincing wide-eyed innocence". "Both child-actors deliver estimable performances"
"Cameron Duncan, playing Bruno, is a compelling, ignorant but kind child who simply wishes to play with his friends". "As Bruno, Cameron Duncan ... was a stunningly confident performer. "A special mention goes to the actor Cameron Duncan who played Bruno himself, who cant have spent more than 30 seconds off the stage all night, yet at 10 years old managed to put on a performance even the most seasoned pro would be proud of"
"Bruno (played confidently and wittily by Cameron Duncan)"
"There are astonishing performances too from the boy actors playing Bruno ... and Shmuel.